SIGIRIYA, SRI LANKA - MARCH 2014: Young boys play fighting in river, one way to refresh in the Sri Lankan heat. SIGIRIYA, SRI LANKA - MARCH 2014: Young girl jumping from bridge into river. SIGIRIYA, SRI LANKA - MARCH 2014: Young girls playing and having fun climbing on each other in river. 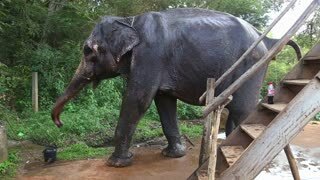 SIGIRIYA, SRI LANKA - MARCH 2014: Mahout taking water from well in bucket and elephant spraying itself refreshingly. 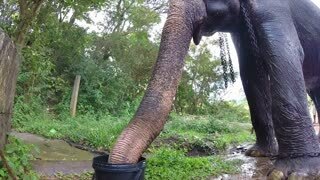 SIGIRIYA, SRI LANKA - MARZO 2014: Cierre de elefante y camión con mahout dándole un cubo de agua para beber. 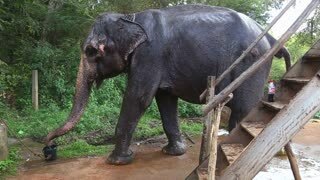 SIGIRIYA, SRI LANKA - MARCH 2014: Mahout taking water from well in bucket and refreshing working elephant. 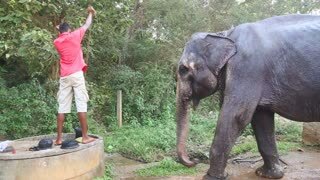 SIGIRIYA, SRI LANKA - FEBRUARY 2014: Man giving elephant some water from a well. 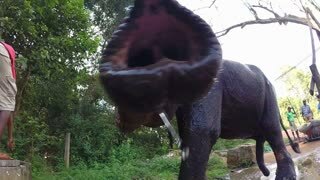 These old working elephants retire to working with tourists.